My laptop resting on with my textbooks and to-do list. The start of a new semester can be stressful and overwhelming, but with organization, determination and focus, students can have a great semester and achieve their academic goals. Keeping procrastination and tardiness at bay is important during the semester. For many college students it’s second nature to wait until the last minute to finish assignments, or to be late to class. Starting assignments early and working on them a little bit at a time will keep a student’s workload in control and keep stress down throughout the semester. “I keep my schedule full; the more free time I have the more time I have to procrastinate,” advises Sacramento City Dental Hygienist Natalie Angel. Setting alarms and timers can be helpful for students with tardiness. “I also set my clocks 15 minutes ahead so I’m not late to class, any appointment, or work,” Biology major Brisa Estrada said. Organization is also one of the keys to success in school, so staying on top of your coursework is important to staying organized. Staying organized with a planner or binder is a common way people keep their assignments and projects in order. 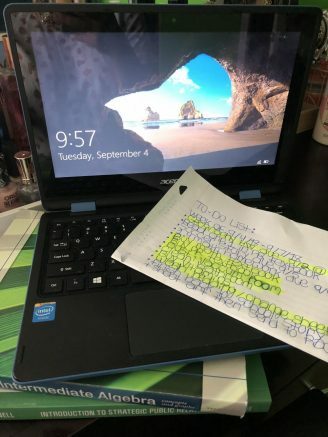 “I organize my assignments by creating my own weekly planner of how much I will be reading each night, [how much] studying, and homework I will be doing,” Administration of Justice major Breanna Wilkie said. One of the most important things to remember is to have fun during the semester, and to take care of yourself— take time to relax, spend time with friends and family, and focus on hobbies. Not having too much on your plate in school, work, or your social life will keep stress down and will allow for more work to be accomplished. Knowing your limits when it comes to managing your workload will make the semester easier and more enjoyable. Going to the gym or reading are two ways to destress. “I give myself a break by going to the gym … [and] spending time with my family in-between the craziness,” says , which is what Wilkie, the Administration of Justice major, does during the semester. Allocating certain days during the week for homework allows for consistency and assures that work will get done. Business Administration major Anayeli Lopez says she has set a homework schedule for herself. “I usually try to do [homework] an hour after school is over because I work, or I’ll try to do it after work as well,” she said. Networking with other students in your classes and creating study groups are great resources as well. Having help and support with coursework from other students makes classes easier and more enjoyable. Going to group tutoring like Beacon tutoring or individual tutoring through the Learning Resource Center Is helpful for subjects such as chemistry or trigonometry where many students struggle. There are many ways to have a great semester despite school not being easy. Balance is key, and as long as you keep balance in all aspects of your life then you should find success in school. 1 Comment on "How to have a successful semester"
hi!,I love your writing so a lot! proportion we communicate extra approximately your post on AOL?